Are you ready for a new obsession? Poldark is about to land on our shores. 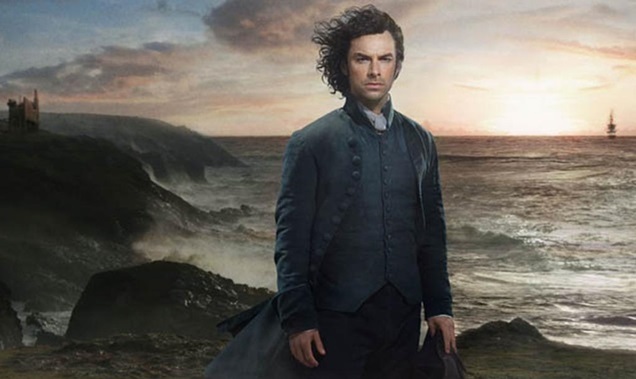 Starring Aidan Turner—call him tall, Poldark, and handsome—the BBC One series debuts here in the states next Sunday at 9pm. Which would be perfect timing considering Game of Thrones will have wrapped, except for the fact that the second season of HBO's True Detective makes its premiere at the exact same date and time. Grrrr! C'mon guys, could you work together, and make Sunday nights a little bit easier please? I suppose I'll have to watch the re-airing of Poldark, which, if PBS runs true to form will be at midnight. Or catch it on PBS the next day via my ROKU device. Oh, my exciting life! Based on a series of books by Winston Graham, Poldark features our hero, Ross Poldark, returning home to Cornwall after fighting in the Revolutionary War, only to find his best girl has given herself to another. Here's a trailer for you. But that's not your Sunday Slacker video, for that I've found a great Q+A with the writer, Debbie Horsfield and director Ed Bazalgette as well as the stars, Aidan Turner (The Hobbit) and Eleanor Tomlinson (Death Comes to Pemberley). Will you be watching? Talk to me! More a comment on generations of actors & aging. Courtroom scene is interesting if you know judge is former Poldark! Which of course it is! Thanks @threewomen_ !